Interested in the latest updates regarding the Scopus database? What's in Scopus? Read the Content Coverage Guide. Learn about mobile access | Scopus is an interdisciplinary citation database of peer-reviewed literature, featuring smart tools to track, analyze and visualize research. Scopus includes Medline as well as most of the references in Embase. 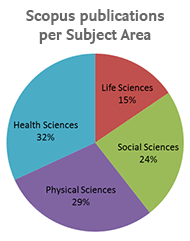 Scopus claims to be the largest abstract and citation database of peer-reviewed literature (mostly journals) with bibliometrics tools to track, analyze and visualize research. Want to learn more? See the Scopus overview page.